On the 11th of October a sea of gallery goers came to the Artbox studio to samples nibbles, wine (and juice), as well as Artbox's latest offerings. The exhibition, titled Meeting Points, showcased the work of artists with learning disabilities and autism collaborating with volunteers. This exhibition focused on the collaborative process, which was, I believe a pertinent choice of exhibition concept. So often in art history, creating art that seems to have been produced in isolation has been seen as a gold standard. This negates the fact that, whether directly or indirectly, art is always collaborative. Even if we are alone when we make our art, it is our interactions with others, whether colleagues, family, or casual acquaintances that shapes how we think about art and what we produce. In the exhibition the fruitfulness of these collaborations were plain to see. In one piece a luminescent, ruby red fish, evocative of the art of traditional Chinese craftsmen, seems to squirm excitedly on the paper. In another, a regal jackal is depicted, painted in the style of ancient Egyptian wall paintings. Abstract painting was strongly represented, from Hisba and Sara's patterns of collated triangles, to Chris and Suzie's dense, wave-like prints and paintings, combining aquatic shades of blue and green. The diversity of styles represented here gives a clue to the openness of the artists to stylistic difference. The atmosphere was similarly exciting. The studio was full to capacity, and the mood reminded me a bit of a highly successful house party, all appeared to be letting their hair loose! (in the most professional of manner of course). The turnout was particularly good given the damp weather conditions. My exhausted mother even made it all the way to Caledonian road, which for a busy teacher and devoted homebody is no mean feat. Adding to the sense of a happening place was the film crew who had travelled all the way from Belgium to document Artbox. Armed with industrial strength cameras they paraded the gallery, occasionally asking a visitor to pose gazing at an artwork and we all tried to look natural. The feedback was overwhelmingly positive, Madeline Alterman, Artbox founder, remarked on how the crowd appeared to be even more diverse than previous exhibitions. Visitors had come from far afield, and had often found Artbox via the internet or social media. This is something Madeline hopes will "happen more and more." 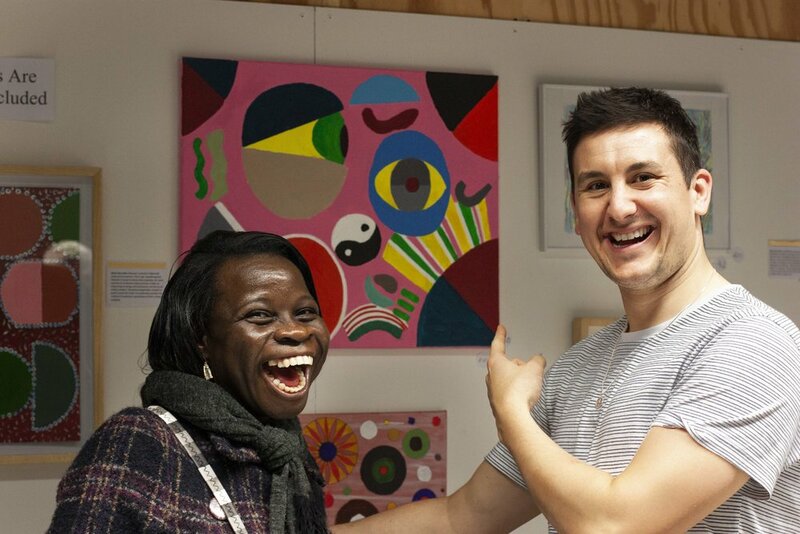 It was heart-warming too to observe the artists, who were often so excited when they sold; "People love my stuff", Toyin said, with a smile and sense of conviction. I am told that Chris and Sam erupted in a dance of high fives at the end of the evening, an apt celebration indeed, considering they had sold out. One Janet Solomon remarked on how she would "never forget it". "The world", she said, "was getting better". To find out more about our upcoming exhibition ‘ARTiculate’, on Thursday 29th November please click the link below!